A rift has been created between the Bangladesh government and activists. Reason: a bill that gives powers to the government to declare forest areas protected while pushing for co-management of forests by authorities and communities. Activists say the bill, if passed, would put forests and wildlife at risk. The Wildlife (Conservation) Bill, 2011, was placed in Parliament on August 23 and sent to the parliamentary standing committee of the Ministry of Environment and Forests (MoEF) for review. But wildlife experts and forest rights activists say the bill, which seeks to modify the existing Bangladesh Wildlife (Preservation) Order of 1973, is ill-conceived. For instance, it allows buffer zones within protected areas and permits commercial extraction of timber from the zones under social forestry programme. The bill lays emphasis on participatory forest management but provides no clear definition. More nefariously, the bill allows social forestry initiatives to be brought under the direct supervision of the forest department. Forest officials manage 1.52 million hectares (MHA) of the total 2.52 MHA forestland in Bangladesh. Village and unclassified state forests account for the remaining forestland. Environmental lawyer Syeda Rizwana Hasan says the bill is an attempt to legalise the Integrated Protected Area Co-management, a five-year USAID-funded project that pushes for co-management of wetlands and protected areas. “Joint participation is a facade as the forest department will continue to wield power over constituting co-management committees,” says Hasan. No forest-dwelling community was consulted while preparing the bill, she adds. There is no mention of public consultation before declaring a protected zone. It does not safeguard the traditional rights of the communities. However, the bill protects the customary rights of fishermen and boatmen in case a wetland is declared protected. “The greatest weakness of the 1973 Act is that it lacks public participation; the bill suffers from the same weakness,” Hasan says. Some of the other controversial provisions in the bill are: it allows forest dwellers to possess trophies for rituals, approves commercial breeding of some species that poachers could exploit by passing off their catch as commercially bred. The draft does not contain any guideline on what should be done to conserve the species identified as being in danger. It also allows hunting with special permits. As per the bill, a person will get two to seven years’ imprisonment and will have to pay one Taka to one million Taka (one Taka=Rs 0.64) as fine for killing a tiger or an elephant. Wildlife expert Roland Halder says although the bill proposes stringent actions, it will give more power to a forest bureaucracy already steeped in corruption. The draft proposes classification of protected zones into 12 categories, including national parks, sanctuaries, biodiversity gardens and eco-parks. All categories will be brought under the forest department despite many of them falling outside MoEF’s present jurisdiction. “The 12 categories are nebulous,” Hasan says. Eco-parks have been rejected by forest communities in the past. “Dividing the country’s protected areas into 12 categories is meaningless considering the government has failed to protect three existing categories,” she adds. Reza Khan, a wildlife policy expert, says the proposed law should instead create categories based on IUCN guidelines, like ecologically critical areas. Commercial forestry and wildlife management do not mix. The bill’s provisions will bog down the forest department, says Khan, as its mandate will span over many existing bureaucracies, such as fisheries, animal husbandry, and land and environment departments. This will lead to inter-departmental rivalries, he says. “The department and its predecessors have failed to protect forests and wildlife. Why burden them with additional responsibility?” asks Khan. Halder agrees. “The forest department has conflict of interest and lacks manpower to implement many of the proposed schemes,” he says. 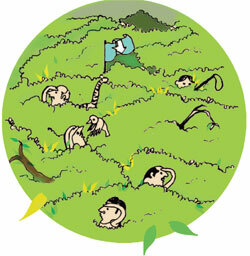 The solution lies in an independent wildlife department, he proposes. In the wake of these misgivings, a three-member sub-committee has been set up to pass its recommendations to the MoEF’s standing committee. It will be interesting to know the results since the sub-committee is chaired by ruling Awami League member of parliament, Sohrab Ali Sana, a shrimp cultivator.